(Nanowerk News) “Soft matter”—those materials that easily deform or structurally change with thermal fluctuations or weak forces—often have the ability to spontaneously form complex structures through the self-organization of molecules. Everyday items such as soaps and detergents and liquid crystal displays in electronic devices are made of these materials. But it is nature that has really perfected the art of molecular self-assembly. Biological molecules are a type of soft matter that are particularly promising for the development of new materials and devices. Dmytro Nykypanchuk—a materials scientist in the Soft and Bio Nanomaterials Group at the Center for Functional Nanomaterials (CFN), a U.S. Department of Energy (DOE) Office of Science User Facility at Brookhaven National Laboratory—has been investigating how the biomolecule deoxyribonucleic acid (DNA) can be used to guide the self-assembly of materials at the nanoscale. In particular, he is studying organic-inorganic hybrid nanomaterials whose structures evolve in response to environmental cues or external stimuli. 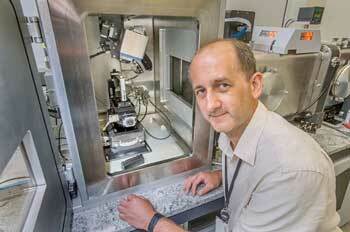 His work has relevance to drug delivery, sensing, energy, electronics, and other applications. In an x-ray lab at the Center for Functional Nanomaterials (CFN), materials scientist Dmytro Nykypanchuk sets up a measurement on a small-angle x-ray scattering instrument to determine the nanostructure of a polymer sample. 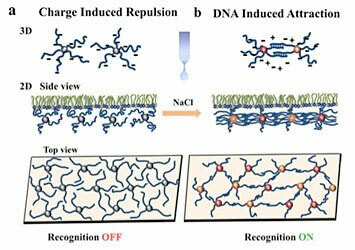 Why is DNA attractive for the self-assembly of new nanoscale materials? Scientists consider all kinds of methods for the self-assembly of materials. One such method is non-specific self-assembly, in which interactions between a single type of molecule lead to a combined geometry at the micro- or nanoscale. For example, soap molecules in water form spherical structures called micelles. But this simplistic self-assembly only goes so far in creating specific structures because the molecules can only combine according to their innate intermolecular interactions. In order to expand self-assembly to a much wider range of structures and material types, we need to think first about how to decouple these interactions. In other words, the material you are assembling should not define the structure itself. Or, the brick should not define the building; you should be able to build whatever building you want from that brick. Soap is a surfactant, or surface-active agent. One end of the soap molecule is hydrophilic (water-loving) and thus binds to water; the other end is hydrophobic (water-hating) and binds to oil molecules. 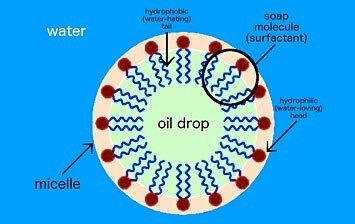 In water, soap molecules form a ring around the drop of oil. This structure is called a micelle. By attaching DNA to materials and taking advantage of its specificity and programmability, we can define these interactions—and thus the resulting structures and properties. This decoupling is the first part. The second part is the DNA itself. You can encode a lot of information in DNA. For example, a DNA molecule only five nanometers long can be encoded in billions of unique ways (sequences)—meaning billions of unique components or interactions. If you attach these DNA molecules to a nanomaterial, then you open up a lot of possibilities for how they can interact with one another and assemble. Watson and Crick discovered the double-helix structure of DNA in 1953, and that discovery has led to much research into how genes control the chemical processes within cells. When did scientists begin using DNA in this other sense—as a tool for the guided self-assembly of nanomaterials? What are some of the other tools that scientists are exploring? The first proof-of-principle papers showing that DNA can be used as a self-assembly tool for nanoscale materials were published in 1996. Medical diagnostic tests and sensors based on this technology already exist, but, in my opinion, it is still a relatively new approach. This different application of DNA arose from scientists trying to get inspiration from nature. Nature can create very complex designs that are autonomous and functional—like the human body, for example. However, DNA is not the only information carrier in nature. Other scientists are studying how biomolecules like peptides, proteins, and RNA could be used as programmable “smart” building blocks for self-assembly. Each of these approaches has advantages or disadvantages and, depending on the application, the use of peptides versus DNA could be more advantageous, or vice versa. Biologically inspired self-assembly holds the most promise compared to other self-assembly methods, but at the same time, there are numerous technical difficulties and limitations. One of the most obvious limitations is that biologically inspired self-assembly is typically limited to aqueous solutions and to near-room temperatures. A simpler approach relies completely on nonspecific interactions between molecules. Block copolymers are an example of this kind of self-assembly, where one molecule has two chemically distinct components. The interaction of these components leads to microphase separation at the nanoscale and ultimately to the creation of a variety of ordered nanostructures. In attempt to widen the use of nonspecific self-assembly, scientists also explore directed self-assembly approaches, in which the materials assemble according to their combined innate interactions, but the assembly is guided by externally applied thermal, optical, electrical, or chemical fields or gradients. For example, one of the groups at CFN uses laser light to drive self-assembly. Molecules and nanoscale objects can self-assemble into one-, two-, or three-dimensional structures. What are the advantages and challenges of using DNA to control the placement of nanoparticles in these different dimensions? The world around us is made up of 3D objects and materials, but experimentally studying 3D systems can be challenging. If you look at 3D structures with an electron microscope, for example, you will see either a projection of the structure or the structure’s surface, but you will not be able to see how each internal component is positioned with respect to the other components. Nanostructures can exist in zero, one, two, or three dimensions. There are techniques to decipher 3D structure—such as tomography, a type of imaging in which images are taken from multiple perspectives to reconstruct a 3D view—but sometimes these techniques can be complicated. With 2D assembly, we have more methods available to visualize the complete structures and all the internal components, such as atomic force microscopy and scanning and transmission electron microscopy. 2D assembly also makes it easier to explain or describe the formation mechanisms or structural changes that occur with changing environments. The advantages of material dimensionality depend on the application. For example, today’s electronic technology is mostly 2D. Computer chips are based on 2D thin films. Fabrication of 1D systems like nanowires can be used to build out nanocomponents, which are then assembled into circuits for electrical, optical, or chemical signals. How do you study these DNA hybrid nanomaterials without disturbing their natural structure? The main tool I use is called small-angle x-ray scattering, in which one can deduce the nanoscale structure of a material based on its scattering pattern. An advantage of this tool is its noninvasive nature—I can look at a material in its native environment and follow its structural evolution. Small-angle x-ray scattering is excellent for uniform materials or highly ordered structures, but the interpretation of the scattering gets more challenging with a mixture of “spices”—nonuniform samples or a collection of cluster-like structures. Cryo-electron microscopy (cryo-EM) is another imaging technique that our group has started to use more often. In this technique, electrons are directed toward samples that have been frozen in solution and preserved in their native configuration. 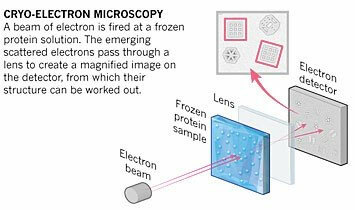 A schematic of cryo-electron microscopy. What do you mean by “dynamic” structures? Dynamic structures are those that can change depending on their environment. Materials and devices used in the real world need to have functions. So, it is not just a matter of creating a single structure; this structure must be active or responsive to external stimuli such as heat, magnetic or electric fields, light, and molecules. This structural flexibility is attractive for applications including drug delivery and sensing. It also is relevant to creating nanoscale “machines” that respond to some change in the environment and do work or convert energy to different forms, such as converting light energy into chemical energy. It sounds like there are a lot of potential applications for your research. In general, what is the end goal? Through my research, I am trying to understand basic principles about the self-assembly and interactions of active and responsive nanoscale systems. My work is driven by curiosity about how things work and a yearning to learn about the world. So, I am not focusing on potential applications, but they are helpful to think about and discuss with scientists in different fields in order to understand what kinds of problems could be addressed using the DNA-assisted self-assembly approach. Ultimately, we want to be able to have absolute control over the dimensions, configurations, and properties of materials—going from a manufacturing process to creating things on their own by mixing the components necessary to produce the desired structures and functions. Self-assembled materials by design is one of the CFN strategic themes, and this theme seems to perfectly align with your work. How did you come to join the CFN? After I obtained my PhD in polymer science and engineering from the University of Massachusetts Amherst, I wanted to work at a national lab. My doctoral work was related to DNA—I studied how DNA diffuses through model porous materials in ordered environments—and for my postdoctoral work, I wanted to use DNA to create new materials. The research on self-assembly and DNA-assisted self-assembly that was being conducted at the CFN sounded really interesting to me. I applied for a postdoc position, which I began in December 2004, back when the CFN only existed on paper. In 2008, I became a staff scientist in the Soft and Bio Nanomaterials Group. What is a typical day at the CFN? There is no typical day! But it is usually a combination of training users and helping them with their projects, mentoring master’s and doctoral students, overseeing various pieces of equipment to characterize the structures and properties of materials—including a small-angle x-ray scattering instrument, an x-ray diffractometer, an ellipsometer, and an atomic force microscope—and, of course, running my own experiments. I often collaborate with students and postdocs and researchers from other institutions, and our group has strong ties with other facilities and departments at Brookhaven—for example, with researchers in the Biology Department and at the Coherent Hard X-ray and Complex Materials Scattering beamlines of the National Synchrotron Light Source II (NSLS-II) [also a DOE Office of Science User Facility]. What are some of the projects that you are currently helping users with, and how do these interactions impact your own research? The user projects are very diverse. One group of users is studying piezoelectric nanomaterials, which generate an electrical charge in response to applied mechanical stress. Another group is looking at how nanostructures affect the absorption of proteins on surfaces. I am also helping users who are studying the self-assembly of block copolymers. The projects are not always directly related to my background and expertise, so I am always learning something new. Interacting with users gives me ideas for my own work and makes me see new applications for how I can apply my expertise in a different direction. For example, I was discussing a project with a user who was synthesizing and studying upconverting nanoparticles, which are nanoparticles that absorb two photons (light particles) and emit a single photon of higher energy—a useful property for many applications, including bio-imaging, bio-sensing, and photocatalysis. We realized that DNA directed self-assembly can be used to address the problem of low upconverting efficiency of the nanoparticles by coupling them with plasmonic particles, typically noble metal particles, via DNA linkage. Using DNA provides a means of precisely controlling the distance between the particles, which is essential for plasmon-enhanced upconversion. DNA that is linking nanoparticles responds to the addition of molecular stimuli and changes the distance between nanoparticles with nanometer precision. The scientists and users at the CFN have different backgrounds not only in terms of their scientific research but also culturally, as many of them come from all around the world. What is it like being part of this multicultural environment? The exposure to different cultures and ways of thinking can be both beneficial and challenging. On the one hand, it makes you think about your own research in different perspectives that could lead to new insights. On the other hand, effective communication is sometimes difficult because a word or phrase that means something in one culture can mean something totally different in another. But despite this challenge, the CFN is a great place to do research. The environment here is very supportive. We are always looking to help scientists do their research better. The CFN also has a strong sense of community. For the past three years during Christmastime at the CFN, we have had a potluck lunch at which everyone brings a dish to be shared. Usually people bring culturally diverse foods, and the lunch provides a really nice time to experience different countries. I am hoping this event will become a CFN tradition! We also have weekly informal gatherings in the lobby to catch up with colleagues and hear about their latest projects. What does your interest in science—and DNA-based nanoparticle self-assembly in particular—stem from? I never planned to be a scientist. When I went to college, I was thinking about a career in industry that would combine technical and business aspects. With this idea in mind, I graduated with dual degrees in chemistry and economics. Even though science was emphasized throughout my middle-school and high-school education in the Ukraine, I did not have a clear idea of what science entails. In my mind, science was something esoteric. It was not until I started doing research on colloids and polymers at Ivan Franko University that I began to understand that science is something that I might like to do. One of my first projects as an undergrad was calculating interactions between particles—in particular, the effect of van der Waals forces on the aggregation of particles, depending on particle size and aggregate configuration. The van der Waals interactions alone are not that exciting for relatively simple cases of one-component systems. But once you start increasing the system complexity, going from single to multicomponent systems, more interesting interactions emerge, and you realize that many processes and technologies in the food industry, environmental science and remediation, and medicine are defined by these interactions. Here is where my interest in DNA fits in. As an information carrier, DNA can be used to program our own “designer” interactions to guide the assembly of particles into “smart” materials—those with properties that can be controllably altered in response to external stimuli. Nykypanchuk and colleagues from the CFN and National Synchrotron Light Source demonstrated a framework for the assembly and tuning of 2D DNA-based nanoparticle systems at liquid interfaces. They tuned the interactions by changing the concentration of salt (NaCl). Without salt, the interactions are dominated by electrostatic repulsion between DNA chains (a). Introducing salt causes an attractive interaction between the nanoparticles because complementary strands of DNA join together. So, I would say my interest in science developed through a gradual process in which I became more and more excited about what I was seeing and learning. I have always liked solving puzzles, and I think that this fascination is one of the reasons I am drawn to science. Every day, there is something new to discover or figure out. What has been the most rewarding experience of your career? It is really exciting when you realize that the phenomenon you observe or the material you create is something absolutely new that no one else has seen or created before. How do you share your passion for discovery with others? Discovering something new is one thing, but disseminating knowledge is another. Passing knowledge onto the next generation, so that students can become interested in science, is an area I have been increasingly pursuing in recent years. In 2016, I became involved in a collaboration between the CFN and Freeport School District to bring nanoscience into K–12 classrooms. Because of safety and training regulations, elementary, middle, and high-school students cannot enter the facilities at the CFN. We came up with the idea for a portable videoconferencing system that would allow the students to remotely “enter” the labs and watch as one of their teachers works alongside a Brookhaven scientist to look at nanoparticles. I knew this project was complementary to my expertise, so I wanted to help out. I continue to work with Freeport teachers today. I also participate in a couple of workshops organized by Brookhaven’s Office of Educational Programs (OEP) and NSLS-II. At these workshops, I introduce the CFN facilities and explain to teachers and students how the schools can use them for student projects, with the setup from the Freeport collaboration as a template. To see the enthusiasm of both students and teachers is a very rewarding experience, which further motivates me in my work. I hope that the experiments that students participate in motivate them to learn more about the world around them.